The annual Pakistan Day military parade held on March 23 is one of the few public occasions where the country’s hard power is open to scrutiny. A mainstay in each event is a distinctive self-propelled gun whose appearance hearkens to another era. Once upon a time, immense howitzers were deemed by the Cold War’s main belligerents as convenient tools for launching tactical nuclear weapons. 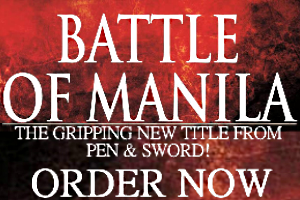 They were also great for softening the enemy before or during battle. The M110 entered service in 1963 as the largest in the US Army’s selection of tracked self-propelled howitzers. These mobile artillery platforms spanned the M107; the lightweight M108; the longevity blessed M109; and the eight-inch behemoth the M110. Three American companies were responsible for manufacturing the M110 whose automotive parts were sourced from General Motors. Utilizing a basic tracked chassis with five road wheels and a small hull, the vehicle supported a 203mm howitzer on a stationary carriage and had a large hydraulic spade behind it. When preparing the M110 to fire, the crew lowered the spade until it touched the ground and then manually loaded the howitzer. It took five soldiers to operate a single M110 and eight were in the tracked support vehicle carrying ammunition. Each of its 200 pound shells were hoisted to the breech with a mechanical arm. Across the Iron Curtain, the Soviet army’s 2S7 Pion served as the M110’s nemesis. During its heyday in the Vietnam War (1965-1973) M110 batteries were considered Corps-level artillery together with the M107, which had a 175mm howitzer instead. Regular infantry divisions had organic 105mm and 155mm towed howitzers that were soon replaced by the impressive M109. According to Forecast International, 1,163 M110/A1/A2’s were manufactured until 1984 and these were upgraded with a distinctive double baffle muzzle brake soon after. The double baffle muzzle brake, which is common among modern howitzers, features four vertical openings on either side of the brake that act as vents for dissipating an artillery shell’s flash. This helps reduce the weapon’s recoil too. Always generous with its allies, the US delivered M110’s to Western Europe, East Asia, and the Middle East. The armies of Japan, South Korea, and Taiwan received substantial stocks of these howitzers. The short-lived CENTO alliance involving Turkey, Iran, and Pakistan were eager customers and kept their M110/A2’s in working order for decades. This explains why the Islamic Republic of Iran’s own regular military, the Artesh, have functioning M107, M109, and M110’s in their arsenal. The biggest drawback for the M110/A2, however, is its fire control system is antiquated, leaving its accuracy in doubt. Current self-propelled howitzers have interactive terminals or screens allowing the crew to input commands, set coordinates, and view maps. This allows batteries to not only pinpoint the same targets with GPS or alternate mapping software, but communicate with the rest of the division they serve. Besides VHF radios and optical sights, the fire control suite for Pakistan’s M110A2’s look untouched. The Pakistan Army is estimated to possess more than 4,000 artillery pieces of various calibers. 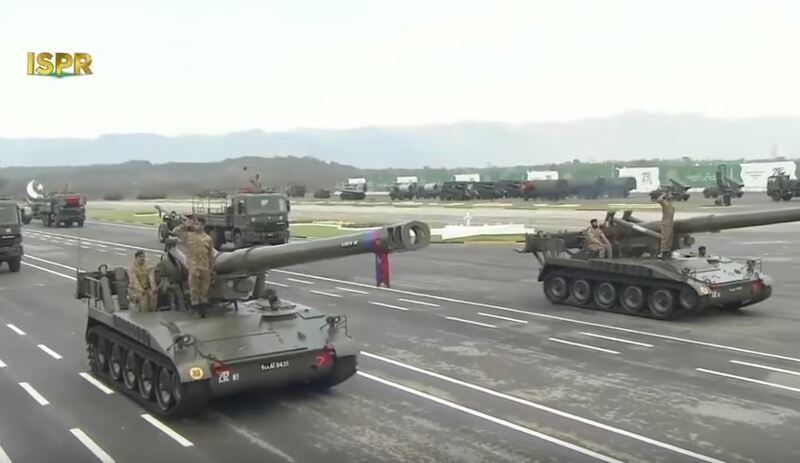 Most are towed 122mm and 130mm guns manufactured in China, whose leading state-owned arms manufacturer intends to sell Pakistan its latest 155mm system, but at least several dozen M110A2’s are still in service. Even with their limited range–a high explosive round can reach targets 16 kilometers away–there are claims rocket assisted ammunition for the M110A2 are effective between 24 and 30 km. 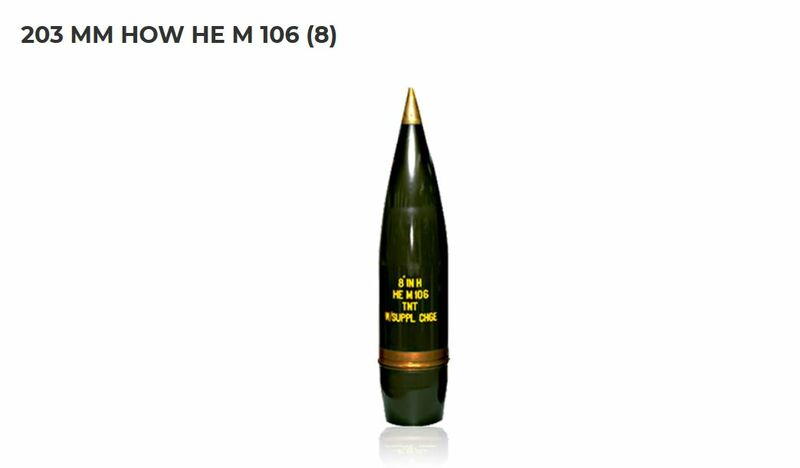 This may fall short of how far newer 155mm ammunition travel, but the sheer explosive force of a 203mm HE shell should be welcomed by any commander. There’s no evidence of Pakistan’s military keeping tactical nuclear warheads for their 203mm howitzers, which is a role assigned to the army’s short-range ballistic missiles. The state-owned ordnance factory does manufacture ammunition for the M110A2 and this is sufficient proof the howitzers are in service. The availability of the POF’s 203mm ammunition is a potential source of export revenue with at least 10 countries (Bahrain, Egypt, Greece, Jordan, Morocco, South Korea, Spain, Taiwan, Turkey, Vietnam) keeping their own M110’s either operational, in reserve, or mothballed.